Privately-owned swimming pools are more common now than ever before. At the same time, community swimming pools remain popular attractions in neighborhoods of all kinds. These pools allow friends and families to spend enjoyable time together and find welcome relief from summer heat. Sadly, they may sometimes lead to tragedy. 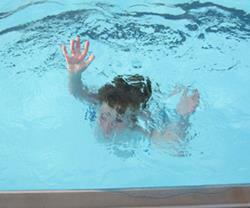 Each year, about 2,000 children are rushed to emergency rooms for swimming pool-related injuries. In addition, another 300 children drown in pools. If your child has been injured in a swimming-pool accident due to another party’s negligence or a defective product, contact child swimming-pool-injury lawyer Jeffrey Killino at 877-875-2927 to discuss your legal options. Anyone who owns a pool, public or private, has a very important responsibility to make sure it is not a danger to children. All pools should be adequately guarded against neighborhood children who may fall in, and equipped with functioning safety features. Additionally, public pools should be closely watched during business hours by trained lifeguards. When these basic steps are not taken, the results are often tragic. Pool accidents often result in diving-board injuries, pool-drain injuries, electrocution injuries, and others. The most dangerous injuries associated with swimming pools are submersion injuries, or those caused by being underwater for too long. Children who survive these injuries can suffer brain injuries caused by lack of oxygen, resulting in life-long impairment. Cuts, bruises, and skull fractures are also common, especially when children are allowed to run near the water. When one of these injuries causes a child to fall into the water, the outcomes can be especially severe. The laws related to swimming-pool owners vary from state to state, but most states’ laws include the following regulations for private and public pools. Lifeguards should be made available during certain times when children will be allowed access to a pool. The hours during which a lifeguard will be on duty should be clearly posted. Rules for pool behavior should be conspicuously posted, such as no-running rules and prohibitions against diving into shallow water. Water depths should be clearly indicated. Life-saving equipment should be supplied and maintained and made available for easy and ready access. Most states’ laws require owners of private pools, such as those on a homeowner’s land, to erect fencing around a pool to prevent access to the pool by children who have not been invited onto the owner’s land and whose presence is unknown to the owner. These regulations generally include fence-height and other construction specifications that must be complied with in order to meet the rule’s requirements. According to the American Academy of Pediatrics, fences at least 4 feet high should be erected to completely surround a pool. The law of premises liability often governs an action brought to recover damages for pool-related injuries occurring on private land. Premises liability law refers to the law that applies when someone is injured due to the conditions of land, buildings, or other premises, including swimming pools. Though premises liability law also varies from state to state, it generally follows three theories of liability, which depend upon the nature of the individual who has suffered the injury in question. If an individual has been invited or allowed onto the owner’s land, that individual will be designated an invitee or licensee under some states’ laws, and the owner will be held to a duty of care to keep the premises reasonably safe for such individuals. In many such states, the owner will not owe such a duty to trespassers on the homeowner’s land. An exception to the no-duty to trespassers rule generally exists with respect to child trespassers who are enticed onto someone’s land by an “attractive nuisance.” An attractive nuisance is something that is generally attractive to a child and that is likely to lure a child to it. Under the doctrine of attractive nuisance, a private pool owner would be held to a duty to keep a pool safe from trespassing children. The existence of such a duty is primarily responsible for states’ laws requiring fencing around private pools that is seen as adequate to keep child trespassers out of a pool. Under certain circumstances, product-liability actions may be brought to address injuries sustained by a child while using a pool. Pool-drain and electrocution injuries, for example, may lead to product-liability actions. If a pool’s wiring is found to be defective, and the defect is found to have been a cause of a child’s electrocution injury, a product-liability action may be brought against the manufacturer of the pool or of the electrical component that malfunctioned and caused the child injury. Injuries related to pool equipment may also be caused by someone’s negligence rather than a product defect. The AAP recommends that pool rescue equipment should be made of fiberglass or other material that does not conduct electricity, and that children should never be allowed access to pools with broken or missing drain covers. If your child has suffered an accident in or around a swimming pool due to another party’s negligence or a defective product, contact child swimming pool injury lawyer Jeffrey Killino at 877-875-2927 for expert assistance with your case.